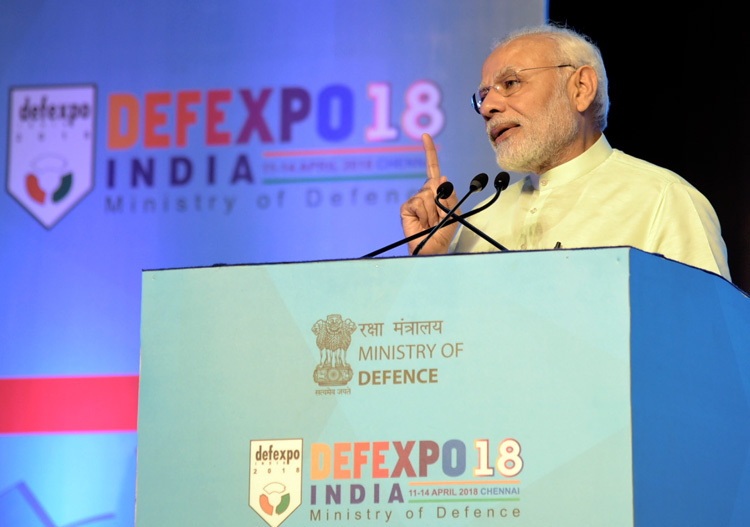 In his speech to the 10th edition of the four-day DefExpo 2018 held in April, Prime Minister Narendra Modi outlined the steps taken by his government to open up defence manufacturing to private sector companies, including the speedy grant of licences for manufacturing and exports, easing of rules allowing for foreign direct investment in the sector as well the setting up of two defence industrial corridors to boost production of critical and new equipment. Factually, this has been the intent of NDA II past four years but there hasn’t been much progress. The new addition is the proposal to establish two defence corridors, which was first indicated by the Finance Minister while announcing Union Budget 2018 in February this year. Ironically, liberalizing FDI in defence and streamlining the Defence Procurement Policy (DPP) is publicized annually past several years with little to show on ground. FDI in defence from 2014 to end 2017 was measly 1.12 cr. Despite PM Modi’s personal push for ‘Make in India’s since 2014, this project is floundering because of lackadaisical attitude and unaccountability of bureaucrats of MoD, as briefed by MoS (Defence) Subhash Bhamre to the Prime Minister towards end 2017. Defence Minister Nirmala Sitharaman followed the policy of former Defence Minister Manohar Parrikar by shifting the DefExpo to own home state despite dedicated infrastructure at Pragati Maidan, New Delhi where the biennial event of DefExpo was held for first eight consecutive times; logically so enabling maximum attendance by military who are the users. DefExpo 2018 with the motto ‘India: The emerging defence manufacturing hub’ saw delegations from 47 countries and over 670 defence firms including 154 foreign manufacturers participating. For the first time there was an ‘India Pavilion’ with displays by government’s Defence R&D Organization (DRDO), Defence Public Sector Undertakings (DPSUs) and indigenous private defence manufactures; all having participated in previous DefExpos albeit showcasing products in separate pavilions / stalls. In a much publicized ceremony presided over by Defence Minister Sitharaman in DefExpo 2018, eight DRDO technologies were ‘transferred’ to public and private sector; like ‘Identification of Friend or Foe (IFF)’, Sonar Dome, Heavyweight Torpedo Varunastra, ASTRA Missile, HUMSA - UG Sonar and ABHAY Sonar. This was needless self-aggrandizement show because transfer of these technologies had already taken place since 2012 in separate ceremonies.). DRDO may have fooled the Defence Minister but not foreign participants who remain abreast of developments in Indian defence sector. As someone tweeted, if there is nothing new to show, falling back on old stuff is the only recourse. In a move termed “unprecedented”, India called in its 44 Defence Attaches (DAs) posted abroad for “specialized briefings” to boost defence exports and explore new markets. This is perhaps bureaucratic brainwave to impress the Defence Minister while hiding the fact that before proceeding on posting, every DA visits DRDO and DPSUs establishments, and that defence exports is part of the responsibility of every DA. The problem in pushing defence exports is the quality of indigenous products and the time-schedule of delivery. It would be better to brief foreign DAs posted at New Delhi on what defence equipment India can export, possible delivery time-schedule defining quantums, practical handling and live demos as applicable. Besides, how about giving priority to making up critical deficiencies of own military? Of the two defence corridors planned, the first corridor will link Chennai-Bengaluru, while the second corridor planned in Bundelkhand region of Uttar Pradesh will also link Agra, Allahabad, Lucknow, Kanpur, Jhansi and Chitrakoot. The defence corridors will obviously boost the DPSUs but how much will they permit privates sector, MSMEs and Statrtup participation is anybody’s guess. The talk of boosting private sector participation in defence manufacturing has been going on decade and a half plus, but this has remained more in theory and little by way of execution. The Dhirendra Singh Committee while recommending the ‘Strategic Partnership Model’ (SPM) for creating capacity in the private sector on long-term basis over and above the capacity and infrastructure that exists in the DPSUs. It had no role for the DRDO (which should focus on R&D), however, the DRDO has entered SPM from the backdoor, hindering smooth execution of ‘Make in India’. This is because of the MoD-DRDO nexus and attenuated corruption, while the military is made to pay three-times the price for items, just one example being share of developing assault rifles under Make in India ‘also’ given to Ordnance Factories despite their demonstrated inability to produce quality small arms past decades. The World Bank recently said that India can innovate like Silicon Valley provided it can expand its innovation ecosystem. This is a big if especially in the defence sector, where unless production and research (barring few sensitive technologies) moves out to private sector, India’s potential as defence manufacturing hub will remain stymied.